When you have spent several days at a conference filled with teachers and it’s the night before conferences of the parent-teacher variety, you really don’t feel like spending lots of time cooking Sunday dinner. That said, you also don’t want to do a frozen pizza or take-out anything since you have been eating out for three days straight. Consult a recipe, of course!!! For me, there are only a few better ways to unwind than drooling over a cookbook or the newest issue of Cooking Light magazine (these ways include massage, Jamaica, endless episodes of Say Yes To The Dress, or napping). 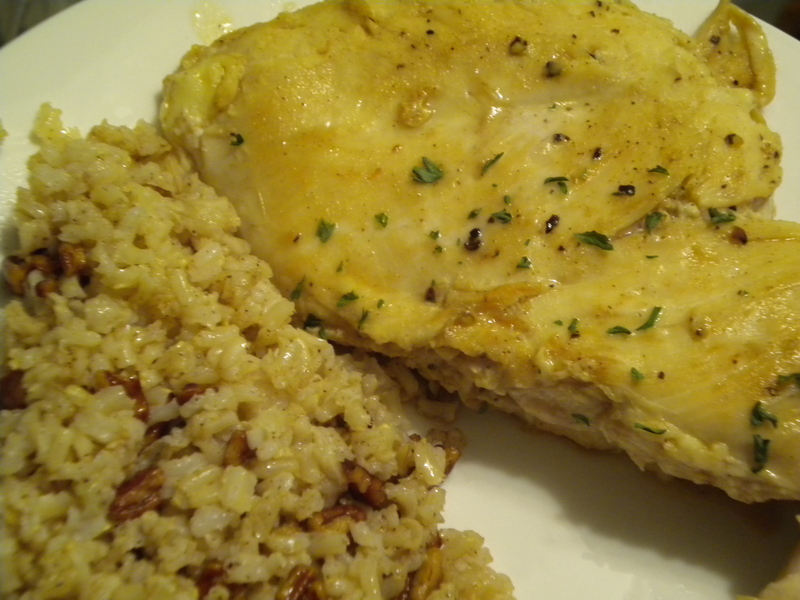 The most recent edition of CL offered a “quick-and-easy” weeknight chicken dish, which is what I had hunted for since hubs took out some chicken from the freezer earlier in the day. All I lacked was one ingredient—apple cider—and since Thanksgiving is just a few gobble-gobbles away, we picked some up to have around anyway. Now, I have made several dishes this fall with cider and cider variants, so I was afraid of overdoing it with the cider. On the other hand, it is autumn, and I feel like I need to eat up all the leave-changing, brisk-blowing, cider-soaked goodness that I can! 1. super fast–from start to finish was about 20 minutes. 2. the flavors were both sweet and savory, without one particular ingredient overpowering another. 3. the side and the main were meant to be, really. 4. pretty much had all of the ingredients on hand. I applaud this convenience! 5. it was a light dish, but not so light that I was still a little hungry. On the contrary, it was just the perfect amount of food to fill my appetite without making feel the need to put on my I-just-ate-a-big-dinner-pants (that one’s for Webb). 2–While the rice is cooking, melt 1 tsp. butter in a large pan over med-hi heat. Add 1 lb. 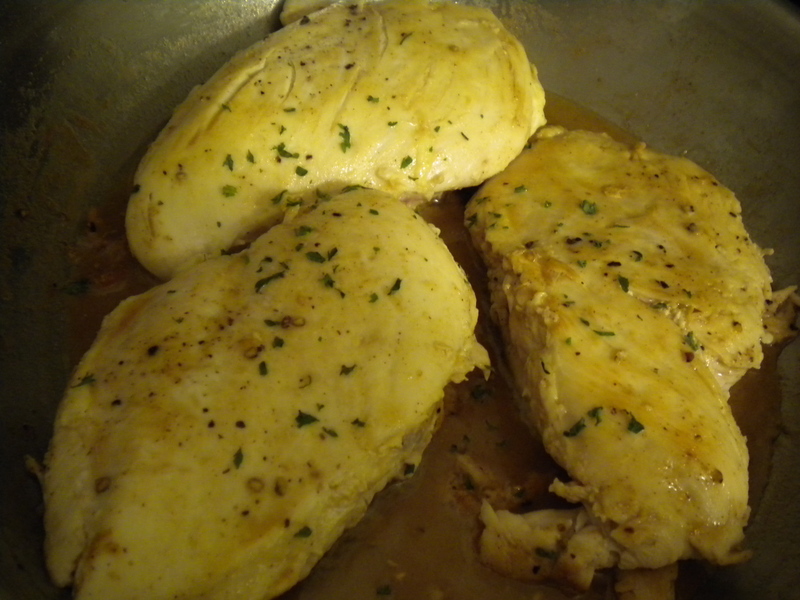 of pounded chicken breasts that you have already seasoned with salt and pepper. Cook for about 3 minutes on each side or until done (mine took about 5 minutes) and remove from pan. 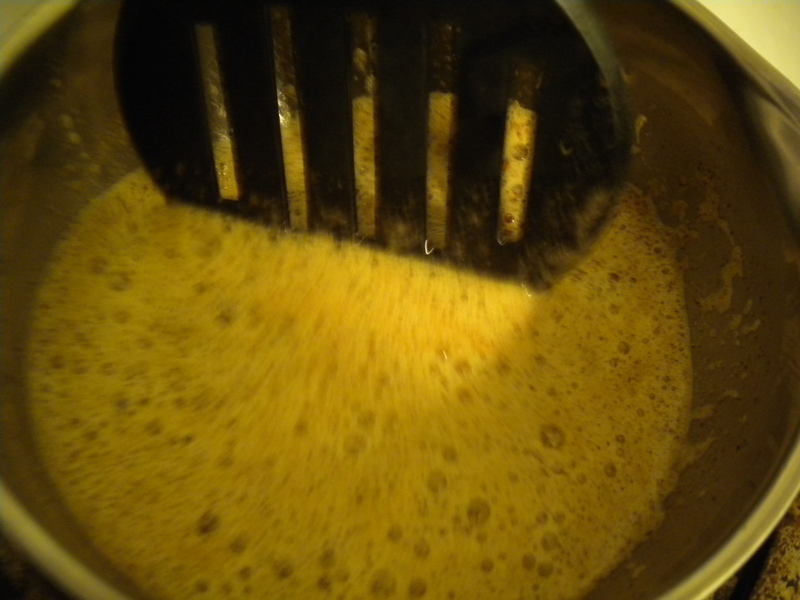 3–Mix up 1 tsp. Dijon mustard (I am sure you could use a honey mustard, or a spicy brown if you like; we like Dijon) and 1/2 cup. apple cider. I also added the lightest dash of cinnamon. Pour into the chickened pan and cook for 2-3 minutes till thickened, scraping up the bits on the pan as you go. 4–Add chicken back to pan, turn it around and let it swim and glaze over, set aside. 1—melt 5 tsp. butter in a small saucepan. over med-hi heat. Let it really melt, let it brown; it MUST get brown! After about 2-3 minutes—when it’s brown and smelling awesome—lower the heat to medium and add 1/4 cup chopped pecans to the pan. 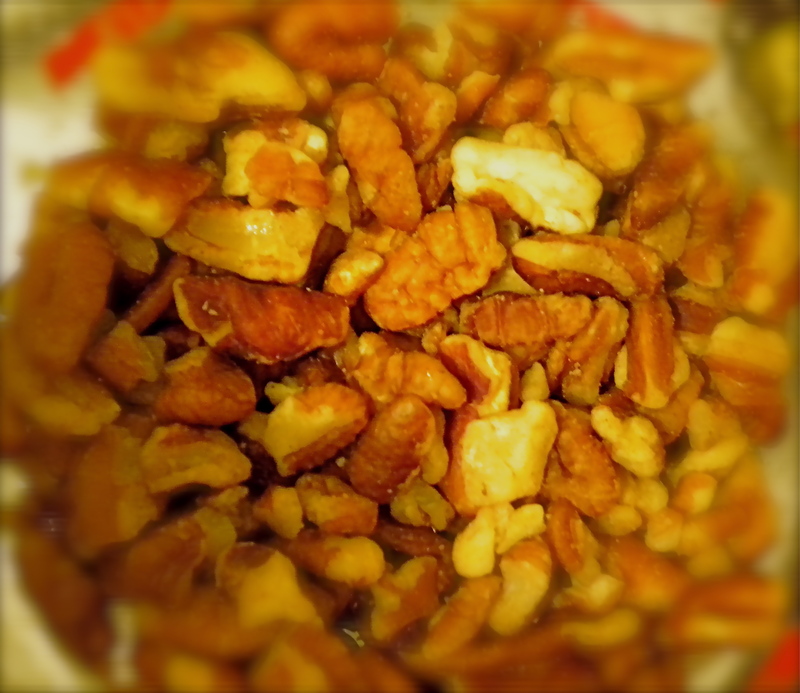 Stir nonstop for 1 minute so the nuts toast and don’t burn! 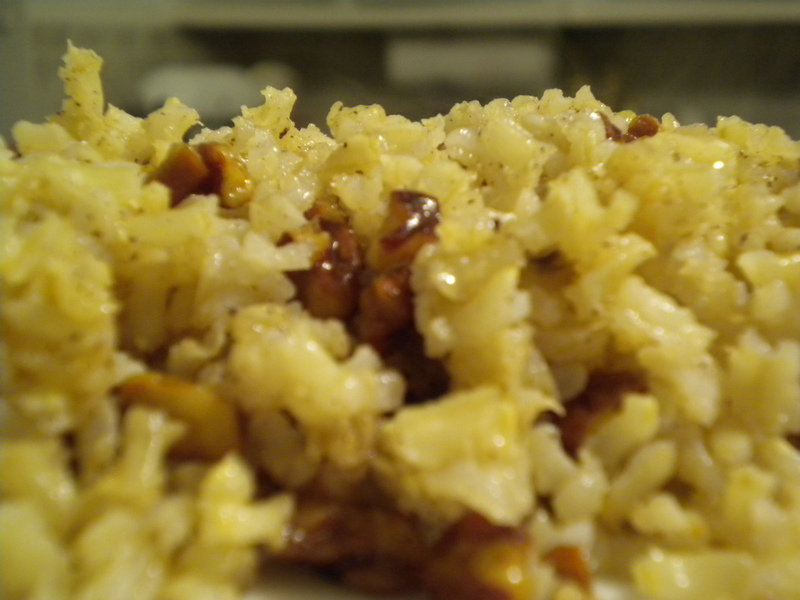 2–pour the mixture over the rice with about 1/4 tsp. salt and stir well. Farley (he who I feed) walked in and said it smelled like fall in the house, that it smelled like home. He took one bite, I took one bite, and before I knew it our Martha Stewart plates were as white as the day we got’em. 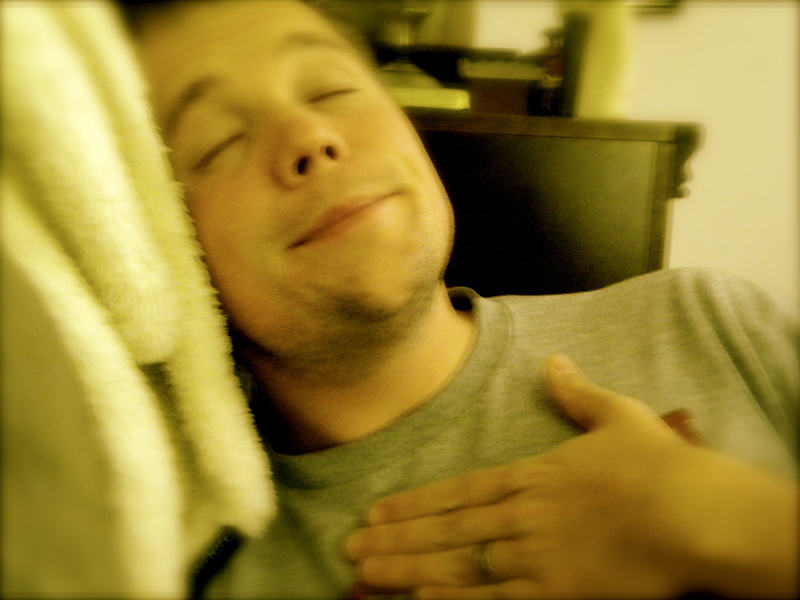 hubs, post-meal. quite content and delighted. (You too can wow your husband with this very simple dish). I love quick easy meals that deliver lots of flavour. Previous Previous post: slow, cooked, and southern.